Last week I was reading An Ember in the Ashes by Sabaa Tahin. I had planned, this week, to read A Torch Against the Night, its sequel. As it turns out, it’s a popular book at my local library, and someone else had it on hold. No renews for me. It’s a shame it took me so long to get to An Ember in the Ashes. 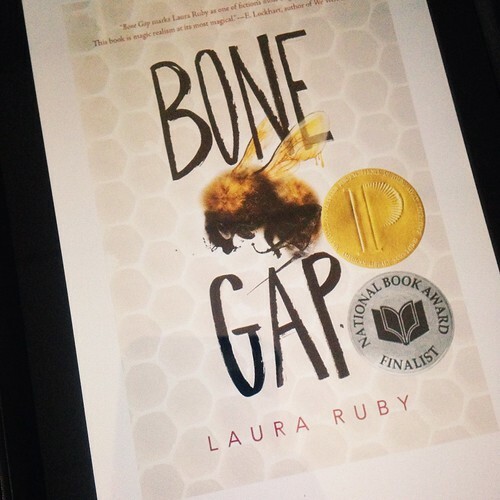 As a consolation book that isn’t really a consolation, I’m reading/listening to Bone Gap by Laura Ruby. Petey’s moped leaned up against ether building, key in the ignition. Finn jumped on the machine. He turned the key and kicked the start lever the way he’d seen Petey do. It didn’t work. *Add your (url) post in Linky over at Freda’s Voice. Add the post url, not your blog url. I’d like to know more about this book. Love the 56 though, for its descriptiveness. Have a great week ahead! Thanks. You too. It’s small town, kidnapping, and a little bit of magical realism. So great. I absolutely adore this book. I hope you are enjoying it. Actually, seeing it on your blog makes me want to reread it right now. I hope you get A Torch Against the Night soon, it’s always hard to wait on library holds. Hope you have a fantastic upcoming week! Yeah it is. I finished it yesterday and thought it was fantastic. Have a great week too. I hope you enjoy it. Happy reading!